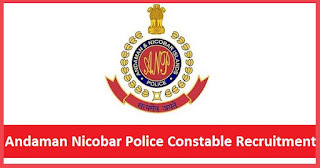 Andaman & Nicobar Police has released a notification for the recruitment of 122 Sub-Inspectors (General Duty and Executive), Constables (General Duty) and More. Interested candidates may check the vacancy details and apply online from 01-12-2017 to 31-12-2017. More details about "Andaman & Nicobar Police Recruitment 2018", including number of vacancies, eligibility criteria, selection procedure, how to apply and important dates, are given below.. Note for You : For more Information, visit Detail Advertisement. For Sub-Inspector: Candidates should have passed Graduation Degree in any stream from a recognised university. For Constable: Candidates should have passed 10+2 in any stream from a recognised board. Selection of candidates will be made on the basis of Physical Efficiency Test (PET), Medical Exam, Computer-based Written Examination. Interested and eligible candidates may apply online through Andaman & Nicobar Police Department website - http://www.police.andaman.gov.in/ - from 01-12-2017 to 31-12-2017 OR by sending their application form along with the photocopies of relevant documents to The Deputy Superintendent of Police (Estt. ), Police Headquarters, Atlanta Point, Port Blair, A & N Islands-744104 before 31-12-2017.